Many instruments are required in the hospital for medical, surgical and laboratory purposes. These are to be carried from one place to another and sometimes they are required in emergency. It is not possible to take them at a time and it requires a man force urgently to deliver all at the same moment. 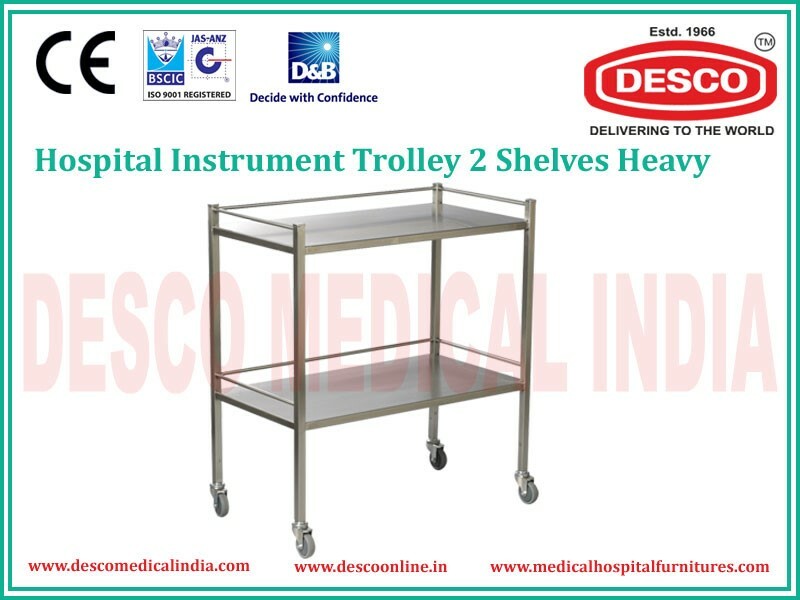 Hospital Instrument Trolleys are manufactured to solve this purpose. These trolleys are made from ISI approved material and available in two varieties of double and triple shelves. 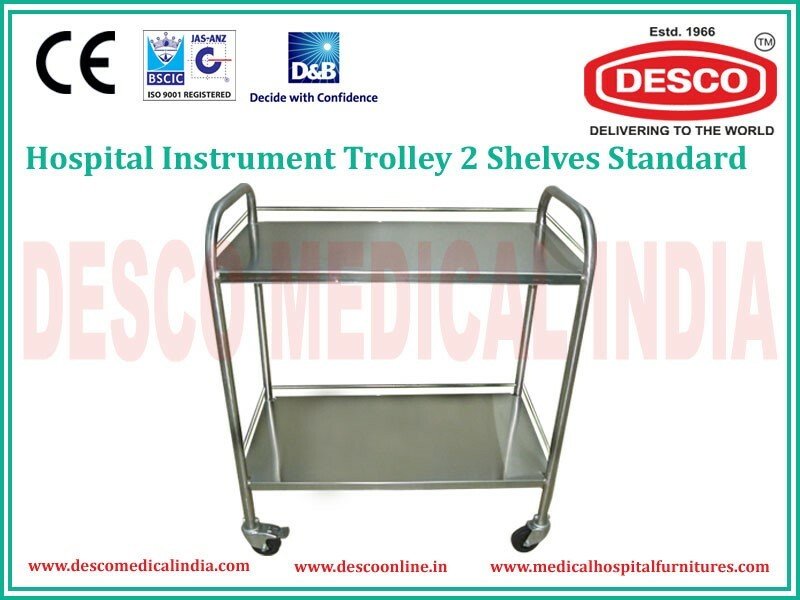 2 Shelves Standard Instrument Trolley- The structure of the trolley is made up of round tube with knock down construction to escape any slipping of the trolley while carrying load. It is provided with two shelves with three side railings in each shelf for support. The two shelves can carry a number of items and the trolley is fixed on wheels so that it can be carried from one place to another conveniently and quickly. 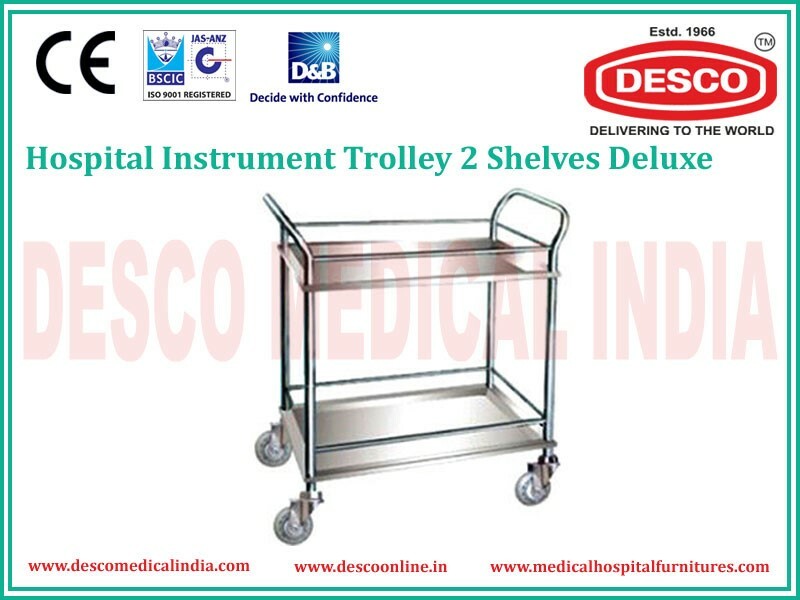 2 Shelves Deluxe Instrument Trolley- The framework is made of round tube and the body is fixed on 7.5cms castors. This trolley has two shelves to ship instruments. 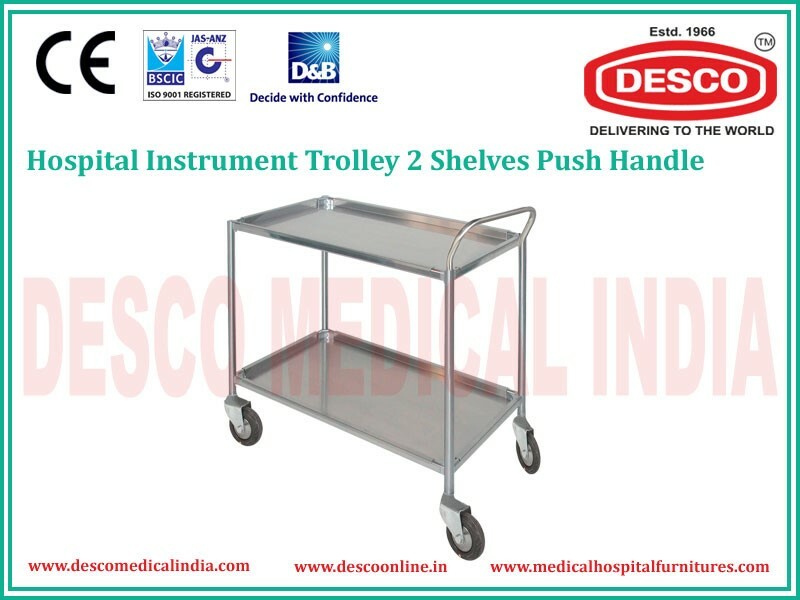 2 Shelves Push Handle Instrument Trolley- This is somewhat different type of trolley which is provided with push handle on one side to slide the trolley. The two stainless steel shelves have up stands on four sides for support so that the things on the trolley may not fall down. The trolley is made up of heavy angle. 2 Shelves Heavy Instrument Trolley- It is made up of heavy round tubes and the two shelves are provided with railings on three sides. The trolley is well constructed to bear load and safe carrying of equipment from one place to another. 3 Shelves Standard Instrument Trolley- All the three shelves are provided with up stands to protect the things from slipping down. The structure is made up of round tube and the trolley is strong enough to carry all the medical and surgical apparatus securely. 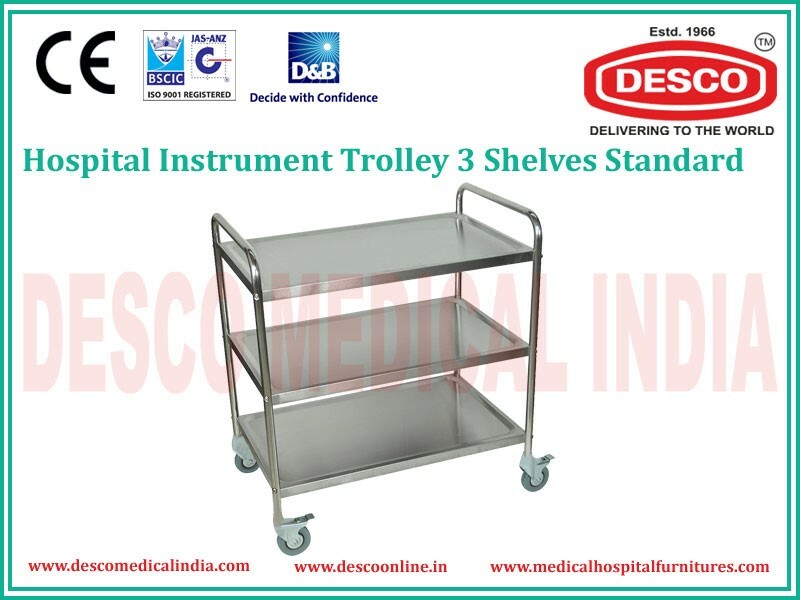 3 Shelves Instrument Trolley with Push Handle- The trolley is manufactured from high class material and is provided with three trolleys with up stands on all the four sides. It has push handle on one side to drive the trolley from one place to another on wheels. Many models are available for each trolley differing in the construction material and measurements. 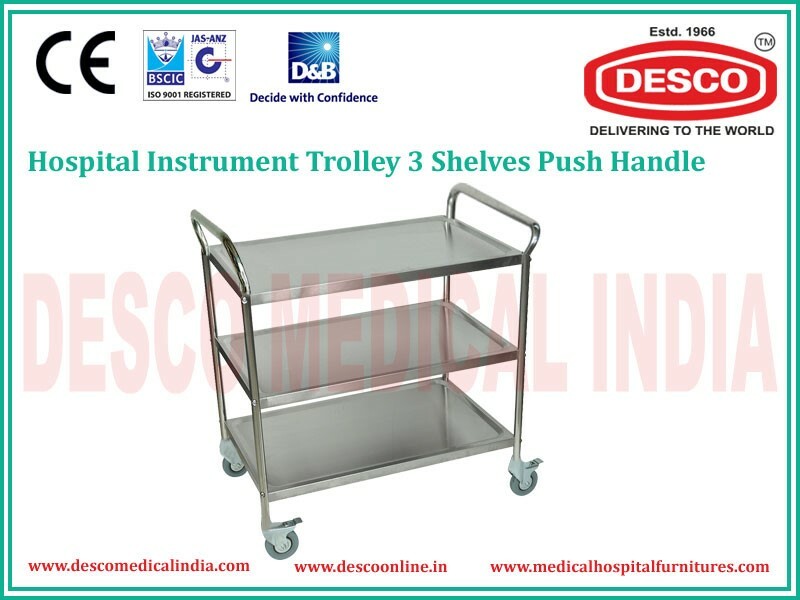 Hospitals and nursing homes require these types of trolleys for carrying instruments and medicines for patients. It is a prerequisite for any health center and it is provided that the quality of the trolleys should be superior enough to be used comfortably and safely. DESCO made products are known for their excellence and they are supplied at wholesale competitive prices. There is a wide range of equipment and furniture to be selected for various needs as trolleys with two shelves and three shelves, with push handle or without push handle, trolleys made up of different materials and measurements etc.